Why do I love garage sales you may ask. Well, there are many reasons but the main one is because I can get rid of clutter and get paid for it. It also gives you some extra spending cash. 1. Prepare – A good garage sale takes preparation. Make an area in your garage that will serve as your workstation. I usually put up a couple of folding tables. On one table, have some cleaning supplies like a bucket of soapy water, windex and dry towels. Clean items always sell faster and for more money. The other table will be your marking station. Once the items are clean, mark your price. 2. Pricing – When you are pricing your items, think of the lowest price you will take for the item and then price it a little higher (ie, if you want $2 for an item, mark it around $2.50-$3). People will usually offer you a lower price at garage sales – it’s expected. Negotiate when possible. Remember, you don’t have to sell the item for a lower price that is lower than your threshold. 3. Set Up Early – I used to live on a very busy road and would start setting up around 7:30am for a sale that started at 8am. Once that first table was out, forget it, the people would show up and start rummaging through boxes. Game on. 4. Have Change – Make sure you have plenty of change available for your customers. This includes change for at least a $20 bill, perhaps more. Usually your first customers will have the largest bills and being able to make change will get you the sale. 5. Appearance – Have plenty of tables to put your merchandise on. I have found that people buy more items when they are placed on tables as opposed to the ground. Also, set up any item that may be boxed. For example, set up any playpens, umbrellas, tents, canopies or strollers. Have extension cords plugged in and available for your customers to try out any electronics. If you have higher ticket items like a TV or Radio, have them plugged in already and working. Have all paperwork (instructions, warranties…) along with the product. This will ensure a quicker sale. Also, put out your “eye-catching” items down by the road. These would be larger items in great shape to attract attention. Bicycles, golf clubs and the like are great for this. Remember, most people aren’t going to stop if they don’t see anything that interests them. Hang any clothing item up on hangers. This has proven to be a challenge at times but it is well worth it. In the past, I have hung clothes from the lip of the garage door, on a pole between 2 ladders, anything to show off the clothes. People will buy clothes if they are presented well. 6. Change – Move items around as there becomes space on the tables. Change out your “eye-catcher” item frequently. This makes the sale still seem fresh instead of picked over. Combine items and remove tables when necessary. As the day goes on, mark your prices down. Remember, the goal is to get rid of the stuff! 7. Advertise – Advertising is a key to a good garage sale. Your location will greatly determine how much advertising you will need. For instance, when I lived on the busy road, I put out 2 signs – that’s it. I didn’t need anything else. Now, however, I live on a road near the back of a neighborhood – hard to find. I choose to do 2 garage sales a year when our neighborhood does them. This saves me from putting an ad in our local paper. If your neighborhood doesn’t do a community sale, putting an ad in the paper is well worth it. 8. Keep a Watchful Eye – At our last garage sale, I had a ring for sale for $40. It wasn’t a masterpiece, but it was gold and had some diamond chips. My husband warned me to keep it on my finger or someone may take it. Well, I am naive. He, however, kept a watchful eye and confronted a lady who put it in her purse with no intention of buying it. He saved us $40, because someone did buy it about an hour later! Thanks, hon. 9. Go the Extra Mile – Have bags available for your customers purchases. At our last sale, our kids took turns selling soda and water for their own enterprise. If it is cooler weather, we will have coffee brewing as well. I put extra work into our garage sales because I really want to get rid of all the”stuff” and I want to make the most money I can. 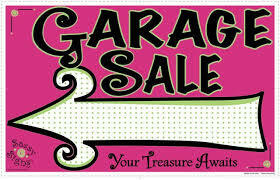 Do you have any Garage Sale secrets to share? Let us know. My Mom has got me so many cute toys at garage sales for super cheap. She has got so good at it that I now give her a list of things to look for and she usually finds them. thanks for this post! i’m planning on having a sale in a couple of weeks and have started to gather stuff in my front room. i have separate boxes for separate prices so that i can just drop stuff in the correct box. it will save time later when i actually begin to tag items. i’ve never had a garage sale before. i plan on hanging up all the shirts and dresses and stuff and folding pants neatly at the table. but i’m wondering…how much do you usually charge for a pair of jeans? a nice shirt? a pair of shoes? i don’t want to go too low, but i definitely want to sell the stuff. any pointers would be greatly appreciated. thanks! My pricing depends on the clothes themselves. If I have a high quality shirt/jeans/shorts I usually price it at $2-$3. Shoes depend on the amount of wear – as high as $5. It really depends on your area, what you are comfortable with and how badly you want to get rid of the stuff. I am very quick to lower my prices because I want it gone. One way to look at it is to ask yourself what you would be willing to pay for them. This is usually a good guide. Next articleFree Pokemon X or Y for Nintendo 3DS or 2DS!